For over a year now The Sands at Nomad has been doing 'trash' clean-ups along south coast beaches (Diani, Kinondo and Gazi) Some of these areas were only able to be accessed during the neap tide and by boat. During these clean-ups the trash collected was separated into plastics, glass, rubber, metals and, the point of this post, cigarette lighters. 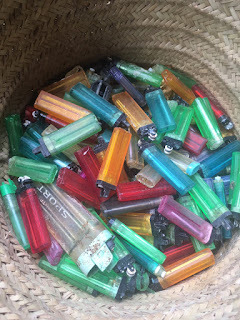 It is amazing just how many lighters from around the world have ended up floating in our oceans and washing up on the beaches. So what can these be used for? 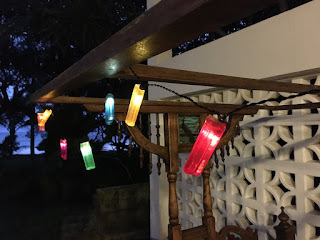 Lots, hanging mobiles, table tops and in this case, christmas lights. The lighter tops were removed, the casing was drilled and normal yellow or white light 'sting light' bulbs were pushed into the drilled holes.